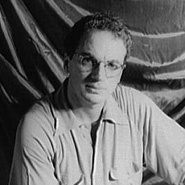 Born in Philadelphia, Clifford Odets dropped out of high school to pursue an acting career. In the 1930s helped found the Group Theatre, a performing collective dedicated to bringing pressing social issues to the stage. His first play to be produced, Waiting for Lefty (1935), climaxes in a defiant call for a union strike. The next Odets piece the Group Theatre produced was Awake and Sing! which told of intergenerational conflicts in a Depression-era Jewish family and is often considered his finest work. Odets' unexpected fame and fortune led him to Hollywood. When he was called before the House Un-American Activities Committee in 1953, Odets' willingness to "name names" enabled him to continue to work in the industry. Odets's work was characterized by street talk laced with poetry, socialist politics, and a knack for plunging audiences into the intricacies of a conflict without so much as a warning.